R - L: The Executive Governor of Edo State, Godwin Obaseki ready to cut the tape, as the President of Ship Owners Association of Nigeria (SOAN), Engr. Greg Utomwen Ogbeifun and the NPA Managing Director, Hadiza Bala Usman watch with rapt attention, on Friday...at Onne in Rivers State. 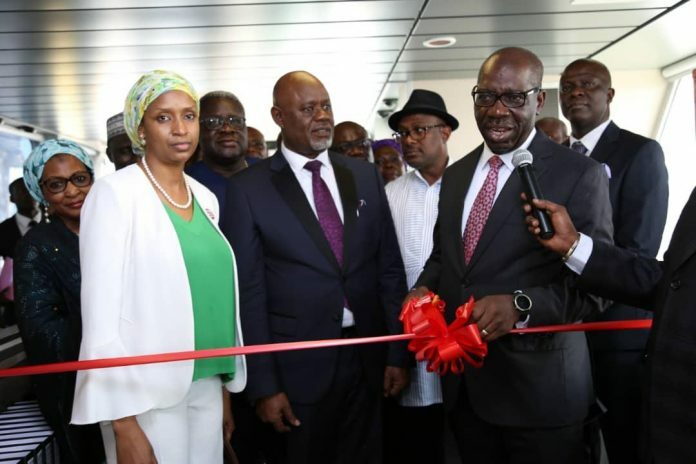 A community of decision makers, economy drivers, maritime, petroleum and energy sector operators led by the Edo State Governor, Godwin Obaseki, and the Managing Director of the Nigerian Ports Authority, Hadiza Bala Usman, on Friday officially christened the MV OSANYAMO in Port Harcourt, Rivers. From the Managing Director, Nigerian Content Development Management Board (NCDMB), Engr. Simbi Kesiye Wabote, the Doyen of the Nigerian Maritime Industry, Chief Adebayo Sarumi, the Executive Secretary, Nigerian Shippers Council, Barr. Hassan Bello, the Chairman of Nigerian Shipping Forum, Chief Margaret Orakwusi, the patriarch of the Ogbeifun family, an 83 year old revered Senior Advocate of Nigeria, the list simply goes continues! The President, Association of Marine Engineers and Surveyors (AMES), Charles Uwadia; Total E&P Managing Director, Nicolas Terraz who was represented by Kenneth Umujoro, the Intels Managing Director, Silvenus Beninato, the former NSC CEO, Capt. Adamu Biu, to Dr. Remi Oni, the Chief Operating Officer (COO) NNPC Downstream, Henry Obi, the Stanbic IBTC Boss, Dr. Demola Shogunle, to the Senior Pastor, King’s Church. Speaking on the occasion, Hassan Bello specifically noted that while the CEO and Chairman of the STARZS Group, and Arrowhead of Ship Owners Association of Nigeria (SOAN), Engr. Greg Ogbeifun did not re-invent the wheel, he had, actually elongated the beauty of its process, in a most significant way. The NPA Managing Director, Hadiza Bala Usman said she was glad that it was the unique and laudable aspect of President Muhammadu Buhari’s developmental policy that midwifes it. Even as the Intels Managing Director, Silvenus Beninatos praised the authorities, the financial system and the STARZS Group for their dedicated commitment to the development of the maritime industry. The highpoints of the event were the arrival of the Edo State Governor, Godwin Obaseki and the revelation of how a young boy, who anonymously phoned Engr. Greg asking for help, later, metamorphosed from an Office cleaner, under the Nigeria’s foremost shipping mogul, Utomwen Ogbeifun into a proud Nigerian sailor!